This patient was unhappy about her gummy smile, dark, short and crowded teeth. 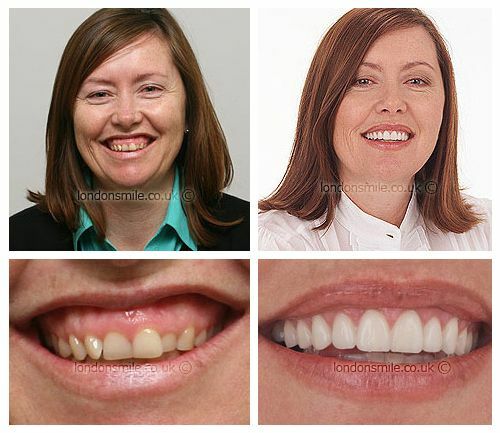 A gum lift was carried out on the upper teeth followed by ten veneers. An Inman aligner was used to straighten the lower teeth followed by whitening. I wanted to change my smile because every time I looked at someone else who had beautiful teeth I felt embarrassed at the horrible smile I had. I used to be called “gummy” which made me cringe. I wanted straight white teeth and less of a gummy smile. My treatment was more comfortable than I expected. The clinic surroundings and my nurse’s calm voice supporting me helped. I didn’t even know I had injections as Tim was so good at it. Any pain was very minimal. I can smile now and expect people to think “wow, what wonderful teeth” and not for a minute think I have had veneers. It has made me smile with a glint in my eye. The team have always made me feel welcome, it’s really made a difference to someone who did have a dental phobia. Calming, lovely and kind! Tim is a whizz. The whole experience really has exceeded my expectations.